Protein mobility on the surface of polymers. Influence of lateral chain length of acrylates on fibronectin conformation and cell response. About two months ago researchers from our group and from other labs here in Glasgow, published a paper measuring how the mobility of fibronectin, a protein with different roles on cell biology, changes when the chemistry of the materials used as surface to support the protein is slightly changed. 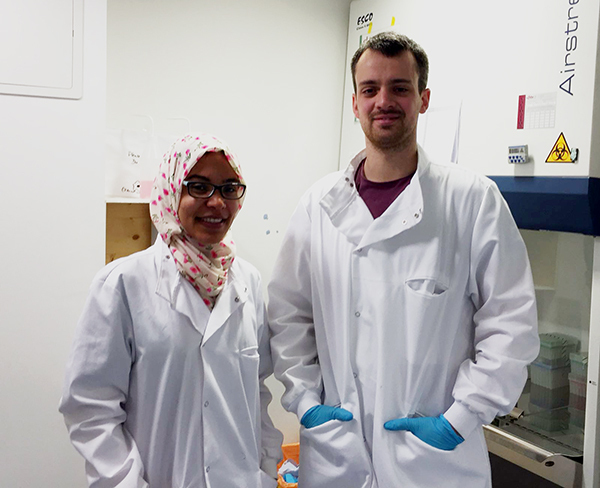 PhD Students Mark Bennett and Fatma Bathawab have prepared this post explaining their work. Cell can be influenced and their behaviour even controlled through the nature of their surrounding environment. An underlying topic of interest in our group is how physical factors such as stiffness, topography (the roughness, shape and patterns of the surface they are in contact with), and more recently surface mobility, induce changes in stem cell differentiation. These stimuli can be strong enough to guide the differentiation of a stem cell to a particular type of adult cell, such as bone or muscle. Surface mobility is a broad concept that can be defined as the range of motion on a surface. In the case of polymers this has a direct relation with the chemical structure of the materials, as polymer chains are long molecules with side chains that can move or rotate more or less depending on their length and the temperature. It is difficult to provide a quantitative description of the properties of the near-surface region, although working with materials that are very similar to each other allows us to draw conclusions about the relative differences in their surface mobility. Figure 1. Fibronectin and material systems. Conceptual figure of how polymer side chain length affects the mobility, by increasing free volume (represented by the white area), and its effect on the fibronectin layer (monomer shown above). PMA(x=1) leads to adsorption of globular fibronectin, with PEA(x=2), PBA(x=4) and PHA(x=6) all leading to the formation of fibronectin nano-networks. The fact that the same organisation of the protein occurs on these three polymers allows discussion of the effect of surface mobility on protein layers with the same initial conformation/distribution and assess the effect of mobility, disregarding major conformational effects of the proteins induced by surface chemistry. 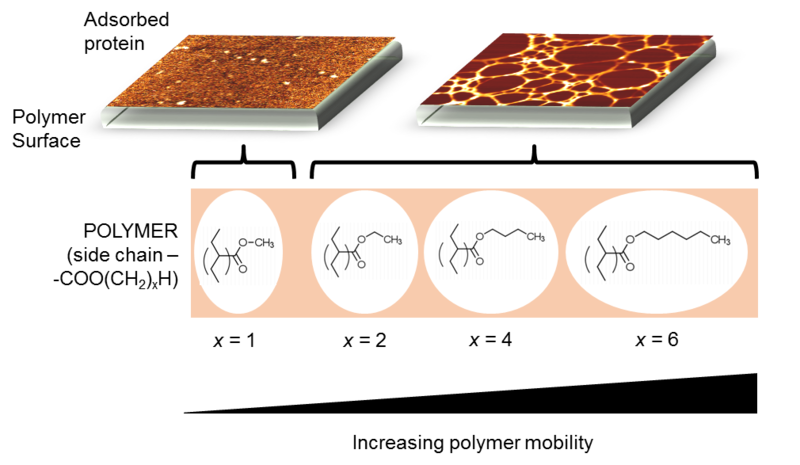 In this work we have prepared surfaces of four different polymer films from the same polymer family of acrylates (Figure 1). They are very similar in their chemical and physical properties except the slight differences in their side chains which gives each polymer a different degree of range of motion and thus surface mobility. In previous work our group has shown that these slight differences in surface properties of our polymers can affect the differentiation of mesenchymal stem cells (MSCs). MSCs are used in regenerative medicine for their ability to form various cell types including bone and cartilage. We knew what the surfaces did to the cells, but we did not know how they did this. While the mobility of these surfaces increases with the side chain length, the differentiation of MSCs did not follow this same pattern. Our work sought to understand how the mobility of the polymer is translated through the extracellular matrix that acts as a mediator between the surface and the cells. Cells do not bind to material surfaces or other cells directly, instead they interact by binding to extracellular matrix (ECM) proteins, proteins that the cells themselves produce and surround themselves with in living tissue. In this work we used fibronectin, an important component of the ECM as a coating on the polymer surfaces prior to the addition of cells. When induced to form bone MSCs produce certain proteins, these proteins act as markers for bone formation. Antibodies which bind to specific proteins are commercially available nowadays and a technique known as immunofluorescence (read the basics about immunofluorescence here) is performed by using antibodies specific for the protein you want to detect, washing the excess antibody and then applying a fluorescent tag to the bound antibody. Lasers are then used to excite the fluorescence attached to the expressed protein marker. The quantification of the fluorescence corresponds to the levels of protein expression. Figure 2. The AFM images here show the network conformation of the protein on each of the polymer surfaces. The graphs show the effective mobility of the fluorescently tagged protein on each of the polymer surfaces. The protein is at its least mobile on the polymer with 2 carbons in its side chain (x=2), where the network initially forms on the surface. The right hand graph shows how the mobility of the fibronectin layer changes as a function of the glass transition temperature (Tg) of the underlying polymer, the Tg is the point at which a polymer transforms from a glassy to liquid-like state. Work performed previously by members of our group (Integr. Biol., 2012, 4, 531-539) utilized immunofluorescence to analyse the expression of osteopontin by MSCs after 21 days of culture on the polymers compared to glass. What was found was that these polymers not only cause fibronectin to assemble into physiological-like networks but they also modulate stem cell differentiation towards bone. Furthermore, we adapted the fluorescence recovery after photobleaching (FRAP) technique, to investigate mobility at the protein level. Since the protein layer interacts directly with the polymers, we wanted to see whether the polymer mobility was passed on to the fibronectin layer. After much thought, we decided to tag fibronectin itself with a fluorophore and use it to coat the polymer surfaces. We then bleached a small area of the fibronectin layer through high exposure to a laser beam and analysed the recovery of fluorescence at the edge of the bleached area. In this setup the recovery of fluorescence reflects mobility of the fibronectin molecules and interestingly we saw that the mobility of the protein layer is dependent on the mobility of the underlying polymer and the conformation of the adsorbed protein layer (Figure 2). Figure 3. (A) When the surface becomes more mobile the cells were seen to reorganise the fluorescent protein layer to greater extent. We also showed that cells were able to respond to these differences in the mobility despite the stiffness and fibronectin conformation being similar. Mouse fibroblast cells were able to reorganise the protein layer to a degree that was related to the mobility of the protein surface (Figure 4), with the trend of the extent of reorganisation following that of mobility. By analysing the differentiation of mouse pre-myoblasts (progenitor muscle cells), we established a link between contractility of the cell’s cytoskeleton and the mobility dependent behaviour of cells. Figure 4. Figure 4. The differentiation of myoblast cells in (B) and (C) implies that the more mobile a surface is the less capable of differentiation it becomes. This becomes very apparent upon the removal of cells ability to exert force on the surface, with actin-myosin inhibitor blebbistatin. In a very real sense this work has shown how closely related the nature our surfaces is to the behaviour cells. Through these results we have a greater understanding of the factors involved in how the surface properties are translated to the cells. † Division of Biomedical Engineering, School of Engineering, University of Glasgow, Glasgow G12 8LT, United Kingdom. ‡ Centre for Cell Engineering, Institute for Molecular, Cell and Systems Biology, University of Glasgow, Glasgow G12 8LT, United Kingdom.